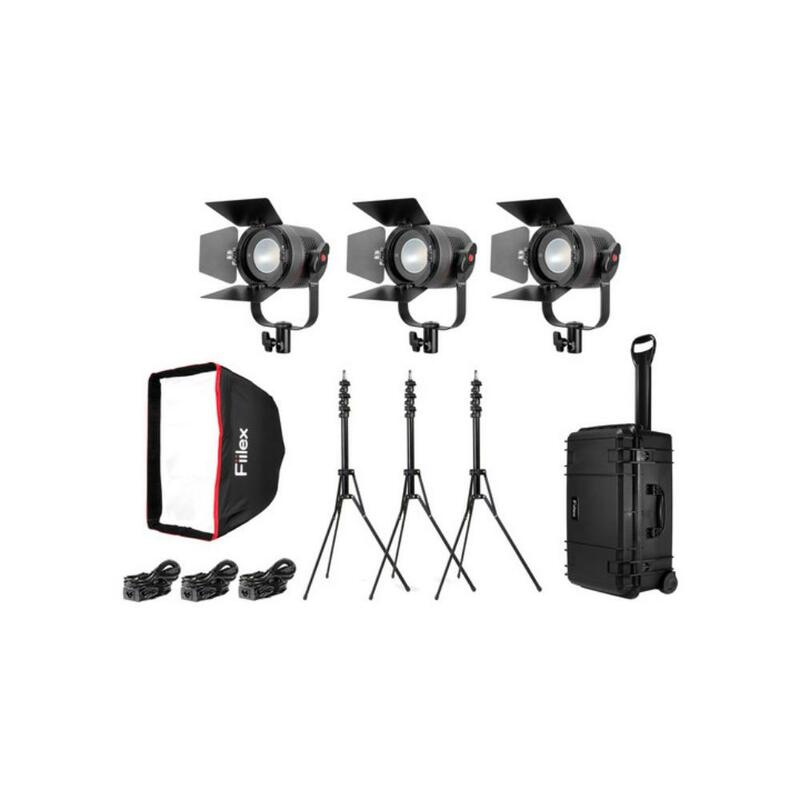 The Fiilex 301 LED Kit uses unique dense matrix LED nodes inside Fresnel-style fixtures for continuous lighting that is both powerful and also very portable. The exceptionally easy-to-operate heads, which use only 3 buttons each (on/off, dimmer, and temperature), can be tilted or paired with the included barndoors to control the beam. Please note that the light modifiers for this kit are not interchangeable with the modifiers that come with the K304 Kit, though the 2 kits compliment each other otherwise on set. These lights offer full spectrum light quality without spiking or flickering and are small enough (4.7" and 1.6 lbs a piece) to be used for very tight scenes. This kit is ideal for 3 light interviews for documentary work, 3 point light setups for portrait work, chroma key work, and natural light filler/replication. While this kit is portable, it is still AC powered and must be plugged in to operate. However, the separate rental of broadcast batteries, battery plate, and D-Tap/P-Tap cables for Fiilex brand lights will make this kit wireless. • The case for this kit is designed to comply with most airline carry-on restrictions. Always check with your airline before bringing this kit on board. • These lights require grounded power outlets (power cords included) to run. If you want to use 12-28V DC broadcast batteries with these lights, you must rent a D-Tap/P-Tap Cable for Fiilex Brand Lights for each head. Batteries are rentable separately.